Life, Laughter and Paris: Here We Go Again! I’ve been AWOL for a while. Every free moment of every day has been taken up with searching for a new place to live. 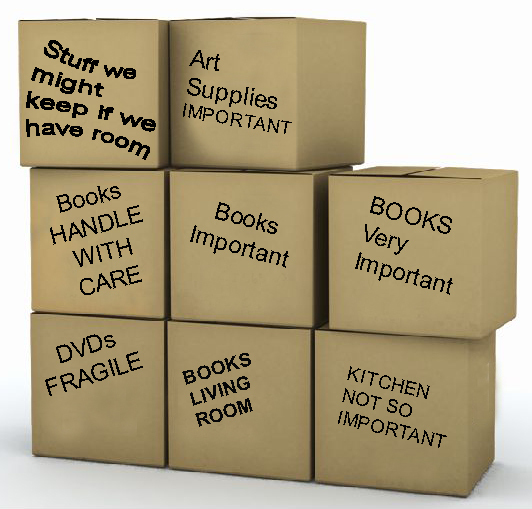 Yes – we’re moving AGAIN. I won’t bore you with the details, but I thought I’d pass on some tips if you’re house hunting, especially if you’re looking for an old home. You can trust me on this…. I’ve seen a gazillion of them. The last time we moved I should have made a list. I didn't because I knew what I wanted. A lovely old house with character that would look great at Christmas. (See? Didn’t have a clue)! This is a repeat photo from two years ago. things haven't even been unpacked! I pretty much made every mistake in the book. I recommend you do the opposite of me and you'll be fine. It's Great! I love the wood trim! It’s gorgeous! It gives the place character! Oh oh: I can’t get the paint drips off this feckin' wood trim. How many people have painted this place? Do I have to dust it EVERY week? There's so much of it! It's Great! This kitchen is huge! It’s like a football field! I LOVE IT! Just think of all the things we can do with this space! Oh oh: What can we possibly do with this space? It’s huge! It’s like a football field. Who needs a football field in the kitchen when it only has two feet of counter space? Besides, we don’t even cook. It's Great! A deck! It’ll get the sun all afternoon! It’s fantastic! Oh oh: The deck is getting the sun all afternoon! Who can sit out here in this heat? Why are raccoons coming to visit? Couldn’t they do whatever it is they do on ground level? It's Great! The windows are beautiful. They swing out instead of going up and down. They’re so elegant! Oh oh: We can’t put air conditioners in these windows! They don’t go up and down! What are we going to do? It's Great! No storage? It doesn’t matter. We hardly have any stuff anyway. Oh oh: Where are the closets? No seriously…. where do we put our stuff? Can we make a table out of the winter tires and the ladder? Will anyone notice? It's Great! This is one fantastic bathroom. Heat lamp, huge domed skylight, two shower heads and those spray thingies that relax your muscles. Oh good! Yup – no mistake there. A great bathroom. Now some places we looked at had HUGE lawns. I mean HUGE. More space than in the houses which were, well, not huge. “This is great. Who mows the lawn”? “This is great. Is there parking”? “This will make a super office. Where are the outlets”? Even with my new found knowledge of house hunting, we didn't succeed in finding the perfect old house. We caved - this time it's apartment life for us and we're looking forward to it. It's got closets, outlets and we don't have to mow the lawn. Now it's back to packing. And packing. And packing. Oh my, moving again. Well, it's an adventure, none the less. Ugh, poor you. It seems everyone is moving. From Mtl.to Calgary. From island to mainland, maybe over the border into Ontario. Close to doctors not too close to neighbours who hate noisy lathes! I wish you folks a lovely place to call home and for now we are staying put! We' like to stay put if we were someplace else :) Thanks Wendy! That's how we're thinking of it - an adventure. If not we'd be tearing our hair out! Do you move a lot?? This was our 21st move in 41 years, plus I am a Realtor by trade so I too, have looked at a lot of houses. Even the few times I thought I had the perfect house, I learned that something about it wasn't perfect. I can't think of a house that I ever disliked to any degree though. Most of them were hard to leave when my husband's job got us transferred. I love the picture. 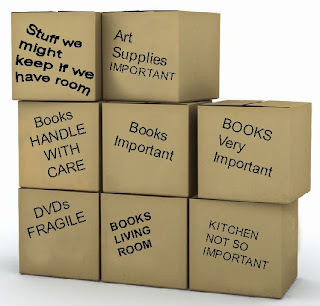 There are always a lot of boxes marked books when we move too. That's just how we're thinking of this move - an adventure. If we didn't, we'd be tearing our hair out! We've moved 3 times in about 30 years (including this last move which only lasted two years). So for us it's a shock to be moving again! 21 moves? Oh my Cheryl....do you ever fully unpack? At least you have an advantage with being a Realtor - you wouldn't make the mistakes I did! I have made mistakes as well because every deal and house is unique. Once we did our final walk through the morning we were to close on a a house and the previous owner had stolen everything. The light fixtures, the mirrors, the appliances,...everything she could strip out of the place. Of course, we could of not bought the house the the moving van was waiting to unload...so what were the options??? There are so many odd twists in the buying and selling of a house. I can't believe people would do that sort of thing! Well yes, I guess I can. But honestly!! You should write a book on your moving adventures! When I was young, it was easy -- all clothes to the suitcase, and... Now it is not so easy any more! Good luck for the move. You're so right Pentti! We need a lot more than a suitcase now :) Thank you - we can use some good luck!